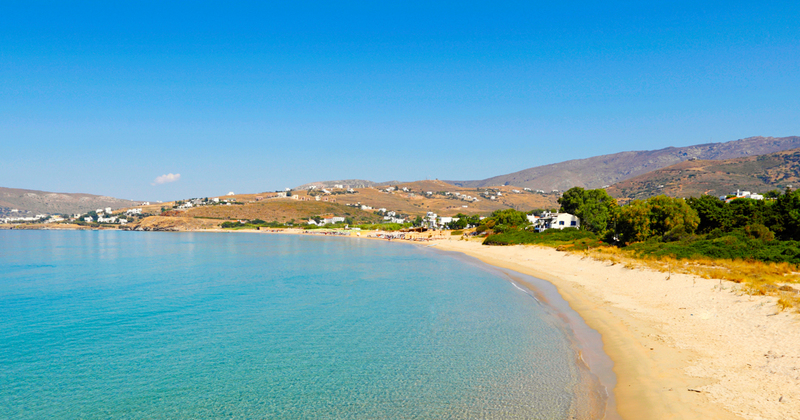 Gavrio is the port of Andros, and it has liveliness all year round. It is well protected in the closed bay revealing itself when the ferry boat passes by the rocks and enters the harbour. The western side of Andros is the first image of the visitor of the island surrounded by beautiful villages and even more stunning beaches. Gavrio is 32 km away from Chora and 45 from Korthi. It was developed at the end of the 1960s when the ferry boats to the Andros Town port stopped, and since then has been the primary port of the island. In recent years it has evolved into a tourist resort along with the area at Kypri Beach. Near Gavrio are the islands known as Gavrionissia. Ships were heading towards Tinos pass near these islets. On the upper side of the settlement is the great church of St. Nicolas and the Primary School. It has many tourist accommodations, hotels, restaurants, taverns, cafes and bars. When the boat leaves and the port empties, the silence takes its toll. Gavrio coordinates with the sounds of the sea sailing and waiting for the next boat to whistle. Gavrio has excellent sights such as the St. Peter’s tower, which is kept in excellent condition. Giannoulis Tower in Ammolohos, a building of the 17th – 18th century that a love story surrounds it. There is also the Spring of Mouria, which according to an inscription was constructed in 1882 at the expense of Leonidas D. Karakitsos. The Mikrogiali northeast of the island near the village of Varidi is a cape surrounded by steep rocks. This harbour probably served either as a port of the island’s inner settlements or as a stopover for Neolithic vessels. The Vryokastro located on the hill at the top of the mountain west of Zorkos with traces of fortification. Kastri is the hill on the left as we enter the port of Gavrio, where the traces of the ancient walls that were repaired by Alcibiades during his exile in Andros have survived. The Castle of “Ostodosias” or the Tower of Makrotadallo is a Venetian fortress, a typical example of defensive architecture. Ostodosia’s castle has many similarities to the Castle in Andros Town although it is smaller. It is located at the northern end at the rocky edge of the Pyrgos beach. Maronitis opposite from Gavrio to Mount Harakas, where remains of the Bronze Age survives and Kastellaki a fortified area located in Gides, opposite the village of Kalokerini. Opposite the harbour is the small village of Harakas, which has been spreading rapidly in recent years. Above Gavrio, Ano Gavrio and Koumari, with a magnificent view of the valley and the sea to the coast of Attica. Within 5 km of Gavrio is the Fellos village. Ideal place for fishing, bathing and quiet, the beach is surrounded by low hills, trees and country houses and near the sea, there is a tavern for food. Makrotantalo is located 10 km from Gavrio and Baridi is at the foot of Mount Vrachaki, at an altitude of 240 m. Near the village flows the river Psatha as well as several streams. 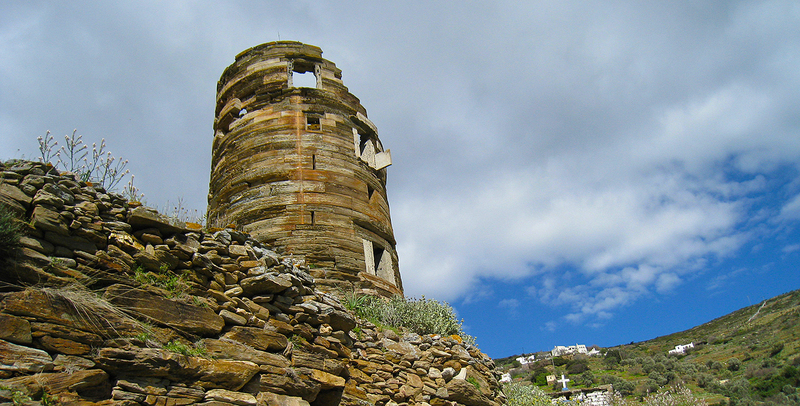 In Kalivari, at the height of 300 m, there is the only wind farm in Andros. The mountain village of Palaistou is built at 203 meters above sea level between trees and low vegetation on the way to the beach of Zorkos. The landscape around Palaistou is excellent. St. Peter is a village built on a hill offering beautiful views of the plain. The beach of St. Peter is magnificent with crystal blue waters. Vitali is a mountainous village with many arable lands and a beautiful beach. Ammolochos is a mountainous village built in the inland of the northern part of Andros, at an altitude of 360 m. The name was taken according to a version of the plant (molocha) that is abundant in the area.